Raduraksti: Pick a language, any language! Here's something you don't see every day. The Latvian State Historical Archives has created Raduraksti, a new online feature housing millions of vital records -- births, deaths, marriages and baptisms -- from a period that seems to cover the late 1800's and early 1900's. This is not a database of names, towns, and so on. Instead, it is a collection of scans of the actual town registers used to collect the original information. As such, this is information to be browsed by town/date/event (birth, death, etc), rather than the usual name lookup that is so familiar (and so easy!). All told, there are more than 4.6 million pages of original records available at Raduraksti. The records themselves are a hodgepodge of eastern Europe languages...you'll find hand-written scripts in German, Russian, Hebrew and Yiddish (for the Jewish enclaves), and (I suppose) Latvian. However, the site interface and instructions are available in English (well-written English, too, which isn't always the case!). Once you register at the site, browsing the actual records is not at all difficult, though the page images themselves are sometimes slow to load. 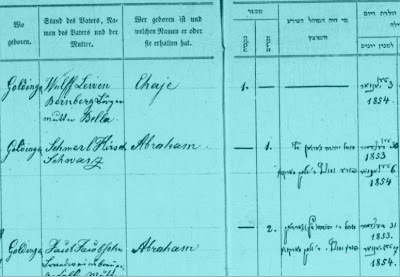 JewishGen, the Jewish family history site (and a fantastic resource in it's own right...I'll have to profile them one day soon) has created a small dataset of births and deaths in Goldingen, a Latvia town currently named Kuldigas (or Kuldiga), if I have my provenance correct. The Latvia Archives are worth a look, even if you don't think you have any family history in the area. More and more archive sites are making these sorts of original records available, and providing search interfaces that can be used by English-only miscreants like myself. It's worth becoming familiar with this type of resource, so you can best take advantage of vital records archives when they become available in your ancestral neck of the woods. All I can bring up is "webpage cannot be found"
Thanks for your posting.I like this blog.Really wonderful...!!!!!!! It's really an impressive posting. I liked it & think that it will be helpful for others. Keep up the good work. Good luck. really this is a good posting. It's really a good posting. I like it. It's pretty much impressive to me. i think others will agree with me.